The suspects range from several individuals at the college where he used to teach to a woman who knew the victim back in the early '70s at Essex University, then a hotbed of political activism. When Banks receives a warning to step away from the case, he realises there is much more to the mystery than meets the eye - for there are plenty more skeletons to come out of the closet . .
Children of the Revolution is book 21 in the Inspector Banks Series of Mystery Novels. Unfortunately it is a very boring and predictable book. As someone who has not read this series I found myself confused over the personal lives of the main characters. Peter Robinson is a good writer who weaves what could be a great story, but to those who are new to the series it is just confusing. I found the murder mystery to be very predictable. The main detective goes to investigate a murder. Has his team talk to all the victims’ family, friends and colleagues. Comes to the wrong conclusion at first and then finally figures out the truth. To me this book was very slow. I actually found myself not wanting to continue, but I slowly plodded along and was actually relieved when I finished. To me this is not the best book. But if you are a fan of the Inspector Banks Series go ahead and read. But if you have never read this series you may want to go back to the beginning. 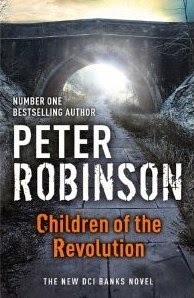 Peter Robinson's award-winning novels have been named a Best-Book-of-the-Year by Publishers Weekly, a Notable Book by the New York Times, and a Page-Turner-of-the-Week by People magazine. Robinson was born and raised in Yorkshire but has lived in North America for over twenty-five years. He now divides his time between North America and the U.K.